The Pittsburgh Pirates (the team that would be renamed Steelers in 1940) hadn’t accomplished much in their first five seasons. While they broke even at 6-6 in 1936, they went 13-31-2 in the other four years, including a 4-7 tally in 1937. Coming into the ’38 season, their second under Head Coach Johnny “Blood” McNally, they had added a marquee player in HB Byron “Whizzer” White (pictured above). 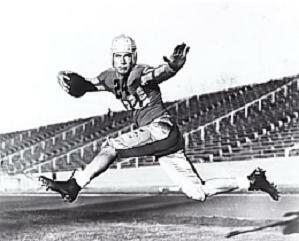 White had been a consensus All-American as a senior at Colorado in 1937. He had gotten a college scholarship due to his strong academic record (which would have an effect on his pro football future as well as long-term career) and, having come out of a weak high school football program, White did not have a strong background in the sport. However, he proved to be an outstanding all-around athlete who exhibited great toughness and determination. A shifty runner who, at 6’1” and 187 pounds, also could run with power, he was versatile at a time when that was a prized asset for a football player and could kick, pass, and block effectively. In ’37, he scored 16 touchdowns in addition to booting 23 extra points and a field goal, starred in a Cotton Bowl loss to Rice, and finished second in Heisman Trophy voting. Having received a Rhodes Scholarship to study abroad at Oxford, White accepted the then-huge sum of $15,000 to put off his further education and play for the Pirates (once assured that he would not lose the scholarship), who had taken him in the first round of the 1938 NFL draft. In becoming the highest-paid player in the NFL, he had to convince those skeptics who questioned the level of competition he had faced at Colorado. On September 9, 1938 White made his pro football debut as Pittsburgh opened the season against the Detroit Lions. The Lions were a stronger team, having strung together seven consecutive winning seasons going back to 1931 (when they were the Portsmouth Spartans) that included a NFL Championship in ’35. Under player/coach Dutch Clark, Detroit had a solid ground-based attack that was powered by fullbacks Ace Gutowsky and Bill Shepherd and wingback Lloyd Cardwell. There was a capacity crowd of 18,000 in attendance for the Friday night game at the University of Detroit’s Titan Stadium. Due to an ankle injury, Clark stayed on the sidelines and didn’t take the field for the Lions, but the home team took the lead five minutes into the first quarter when Bill Shepherd kicked a 27-yard field goal. Detroit got a break later in the period when a bad snap on a Pittsburgh punt went over Stuart Smith’s head and the Lions recovered on the five yard line. Wingback Ernie Caddel ran around right end for a touchdown, although the extra point attempt was blocked. Midway through the second quarter, the Lions moved into scoring position again thanks to a productive passing attack. Lloyd Cardwell ran the last five yards for a TD and this time the conversion attempt by Monk Moscrip was successful. White was kept well-contained by the Lions for most of the game and also struggled with the brightness of the lights when fielding kicks. He played 15 minutes in the first half, gained 12 yards, and was held out during the third quarter. The Pirates never crossed midfield until the final period, but in the fourth quarter, White sparked an 80-yard scoring drive that featured short runs into the line and a long pass interference penalty. He caught a pass from tailback Max Fiske for a 35-yard gain that went to the Detroit 37 – Pittsburgh’s first penetration into Lions territory. The prize rookie finished off the series by scoring from three yards out on a slant off-tackle. A few minutes later White fumbled a punt at his 15 yard line that he recovered at the four. It didn’t affect the outcome – the Lions came away with a convincing 16-7 win. Things did not go well for Pittsburgh the rest of the way. The club was defeated twice more before winning back-to-back games in New York, against Brooklyn and the Giants. But when Rooney sold the team’s best passer and other first round draft choice, tailback Frank Filchock, to the Redskins, the Pirates lost their remaining contests to finish at the bottom of the Eastern Division with a 2-9 record. Detroit finished at 7-4, putting the Lions in second place in the Western Division, a game behind Green Bay. Whizzer White continued to be a bright spot for Pittsburgh as he went on to lead the NFL in rushing with 567 yards on 152 carries (3.7 avg.) as well as yards from scrimmage with 655. He received consensus first-team All-NFL honors (UPI, INS, Pro Football Writers, Collyers Eye) and headed off to Oxford for the next year. White returned to the NFL, ironically enough with the Lions, who traded for his rights. He played two more seasons while attending law school and again led the league in rushing in 1940 with 514 yards. White served in the Navy during World War II, finished his law degree at Yale, and went on to a distinguished legal career that culminated in his being named as an Associate Justice of the US Supreme Court by President Kennedy in 1962, serving for 31 years. Long after his pro sports career was over, he was still able to more than hold his own in pickup basketball games against law clerks less than half his age in the Supreme Court’s gym.